Interior design trends Black is Bold and Beautiful. Black inside the home. The misconception that black visually decreases the space in size has been disproven over and over. 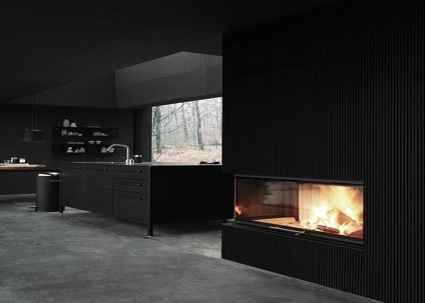 In terms of interior design trends black is becoming more popular with brave homeowners. No more can we avoid the sheer beauty and versatility of the colour black inside the home, especially when wanting to make a statement. Some of the connotations of black are evil and mysterious. Black is associated with fear and the unknown – usually negative connotations surrounds this colour. But black symbolises power, elegance and beauty. One of the reasons why incorporating this into spaces big or small – it has the power to transform a place from traditional to contemporary. It has always been about the perfect combination of colour and texture but let’s focus on texture. When having one colour (black) as the main interior hue, textural differences make all the difference. Matt black wall with black, high polished gloss accessories are the perfect combination to enhance even the simplest of portals such as doors, mirror frames or smoked black light covers. Dark colours such as black are the perfect backdrop for lots of different colours and textures. 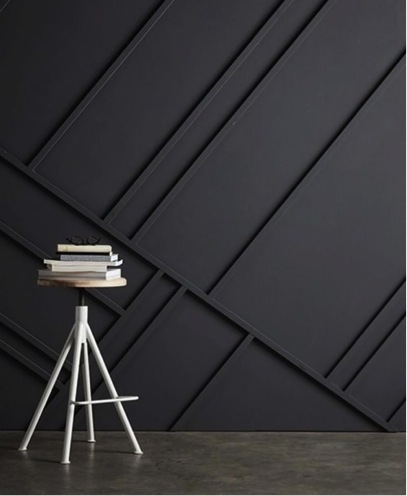 In small spaces, however, the depth and intensity of the colour could make the space look bigger – this happens as the black or moody grey absorbs the light and blurs the edges of the room, giving the illusion of more space. For a less robust look, try using a black and white wallpaper on a feature wall to bring a little light into your space. 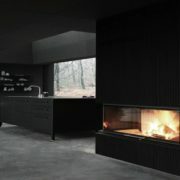 The ideas of having black inside the home are no longer out of the ordinary. Envision what you want the space to look like and create it – simple. A place you can enjoy and call your own. Neighbours to our North Kensington office, Violet & George was born in 2009 out of a passion for exquisite textiles and meaningful, elegant design. Since then, they have become synonymous with luxurious interiors created to reflect and magnify their clients’ individual tastes. They’re ‘new fashioned’, skilled in the traditional crafts of interior decoration and fastidious about attention to detail, but at the same time aware of contemporary trends, taste and technology. The attention they pay to what matters most in the lives of their clients sets them apart. Their design and decoration consultancy flexes to work whichever way suits their clients best. It includes made-to-measure tailoring and upholstery, paint and fabric advice, intelligent lighting solutions and unique decorative flourishes. From the West London studio and workshop in Middlesex, their designers and craftsmen collaborate with a trusted network of specialists to ensure exceptional levels of fit and finish. And high levels of customer delight too. No request is too exotic (or mundane); no imagination too wild; no expectation left unfulfilled.